IT Works Weather Station - just £9.99 @ Comet !!!! Comet is coming up with lots of good offers recently & here is another billy bargain. IT WORKS KW9009-U Weather station is now just £9.99 @ Comet. (was £29.99) . Choose store collection option to avoid paying delivery charge. Check the weather forecast before you even get out of bed in the morning with this IT Works weather station with indoor and outdoor temperature readings and barometer with forecasting symbols. I could do with one of these myself.... usually rushing about the house I don't realise how cold it is outside, and sometimes the kids complain because I haven't wrapped them up enough! Thanks Edi! Ordered mine too for collection at store - thanks. Don't forget £1 via TopCashBack for every collect from store purchase. I have the next model up (]http//ww…256) and that has a wireless temperature sensor. Works really well and pleased with it. which brought price down to £14.99 but now at £9.99 I must get one. I'm not sure how these things have been shifting for Comet but I was last in our local Comet store about a month ago and they hundreds of these things at this price. Ordered mine too for collection at store - thanks. Don't forget £1 via … Ordered mine too for collection at store - thanks. Don't forget £1 via TopCashBack for every collect from store purchase. Thank, ^^^ how do i do that? and do we have any money off codes for comet? ..... and do we have any money off codes for comet? Superb deal, just have a look at some of the weather stations on some websites, you won't find many as good as this at the price. Welcoem to HotUKDeals JeanieM and Bassrock too! I assume this runs off batteries? 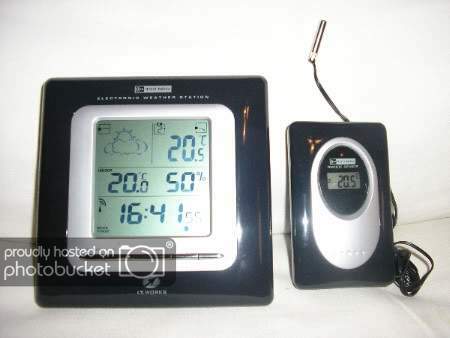 This most high-tech weather station features, as well as the standard functions such as indoor and outdoor temperature and humidity display, advanced features such as an animated weather forecast with air pressure trend, moon phase indicator and a bar graph that displays the historical barometric pressure for the last 24 hours. The unit is supplied with one wireless remote sensor that can transmit temperature and humidity up to 30 metres away and up to four additional sensors can be added - so you could have weather information on your garage, conservatory, greenhouse, shed and home all from the same unit. The auto scroll function means that the unit will automatically scroll through the data sent from all the sensors. Other functions include clock, dual snooze alarms, EL backlight and a high/low temperature alert. This unit can also be upgraded to use the following additional wireless sensors (maximum total number of sensors is 5). L95BF - External Temperature Sensor with built-in display. Identical to the sensor supplied with the main unit above, this will allow you to monitor additional places, e.g. greenhouse, garage, etc. This unit features a display so that you can read the temperature directly, as well as from the central monitoring main unit. L27AW - Air Quality Monitor. This unit lets you know what the quality of the indoor air is like using icons and figures. If the air is stale, then this sensor will let you know so that you can open windows to let in clean fresh air. This item can be used in conjunction with L32AT or independently (see full details in separate module, nearby). L28AW - UV Monitor. This sensor will advise on the strength of the sunlight outside, so you will know what type of sun cream to use and how long you can stay in the sun without burning (see full details in separate module, nearby). Comes with base unit + 1 remote wireless thermo sensor. Radio controlled time & local weather station synchronization within 6 hours. so you have to stick the wireless thermo sensor outside I take it? The second unit has 1.5m cable with a probe at the end. The second unit should be mounted indoor to avoid the battery freezing in extreme cold weather but the probe should be kept outdoors. 1.5m cable should be sufficient. oh right. How you gonna do that then? Yeah... probe is so thin it can squeeze thru any window gap. Also, setting up is quick and readings are very accurate.